According to the Center for Disease Control and prevention, it’s estimated that 86 million Americans have prediabetes, a condition of high blood sugar levels that could turn into type 2 diabetes within 5 years. But studies have shown that prediabetes (and even full-blown Type II diabetes) can be reversed or prevented through healthy diet and exercise. In a TEDx talk at Purdue University, Dr. Sarah Hallberg cited that as much as 50% of the population could have insulin resistance to some degree even if their blood sugar levels still test normal. With insulin resistance, insulin cannot process the high amounts of sugars and carbohydrates, and the glucose gets stored as fat. As a society, a lot of our diet is made up of carbohydrates — from potato chips and pretzels to bread, pasta, rice and more. Add in the sugars from desserts and store-bought snacks and the hidden sugar in condiments like ketchup, and it's easy to exceed the USDA's recommended 225 grams of carbs per day. Over time, this can cause a condition called insulin resistance or prediabetes. Dr. Hallberg cites success in reversing pre-diabetes and Type II diabetes with a low sugar, low carbohydrate diet. And she’s not alone. There is a wealth of studies supporting her findings (see an overview of the efficacy of low-carb diets by the American Diabetes Association). So when I was diagnosed with prediabetes, I knew that it was time to seriously change the way I ate. I chose a diet high in vegetables, protein and healthy fats and low in starch and sugar (i.e., a low-carb diet). In search of information, recipes, and support, I found the four apps that were the key to my success — Low Carb Info, Carb Counter & Diet Tracker by Atkins, Calorie Counter & Diet Tracker by MyFitnessPal, and MyDietician. MyDietician held me accountable for my food choices and taught me about nutrition, but at $79 it’s pricey. So, I also found less expensive do-it-yourself alternatives. Low Carb Info taught me what high-carbohydrate foods to avoid (or eat less, or smaller portions of). It even has a filter that will list foods that are lower than a specified number of carbs. I chose to follow the Atkins low-carb diet, which counts "net carbs," using the Carb Counter & Diet Tracker by Atkins. And Calorie Counter & Diet Tracker by MyFitnessPal helped me create a goal of the daily maximum number of grams of carbs I should eat and let me know how many I had left for the day after I recorded my meals. The app also makes it easy to get the support you need through its easy-to-use social tools. I started my journey 6 months and 25 pounds ago. My HbA1c blood sugar level was edging toward full-blown diabetes and is now down to almost normal levels. The change in diet also lowered my blood pressure. Low-carb eating is no longer just a diet for me: It's a lifestyle, the way I'll ensure that my body doesn't move toward type 2 diabetes. These apps have helped me find so many low-carb alternatives that I rarely miss my old eating habits. I'm continuing to lose weight, and I'm healthy. It's worth the effort, and with the help of these apps, I’m staying on track. Note: Check with your doctor before starting any new diet program. While using a low-carbohydrate eating plan worked for me, it’s not for everyone. Bread and pasta are obviously high in carbs, but some high-carb foods with low fiber counts offer empty calories that turn to sugar and raise your blood sugar/insulin levels. Once you choose where to limit your daily carb intake, you'll want to know which foods will fit into your allotment. Perhaps you can eat half of a piece of bread or a spoonful of brown rice. Which vegetables have the most carbs? Low Carb Diet Assistant gives you nutritional information for fresh food, popular brands and restaurant food. You can also add foods to the list. It's for iPhone only. For Android phones, I'd recommend LoseIt!. It also has a huge database of fresh food, popular brands and restaurants, which you can access through the free app, and if you purchase a premium subscription ($39.99 per year), you can set your nutrient goals, including carbohydrates. Based on the original book, Dr. Atkins' Diet Revolution, published in 1972, Carb Counter and Diet Tracker by Atkins (which is also a website) is a wealth of information, including recipes and meal plans, and, of course, offering Atkins low carb products. The Atkins diet evaluates food based on how it will affect your blood sugar levels. Processed foods are assigned a "net carbs" number that's determined by subtracting fiber and sugar alcohols from the total number of grams of carbohydrates. 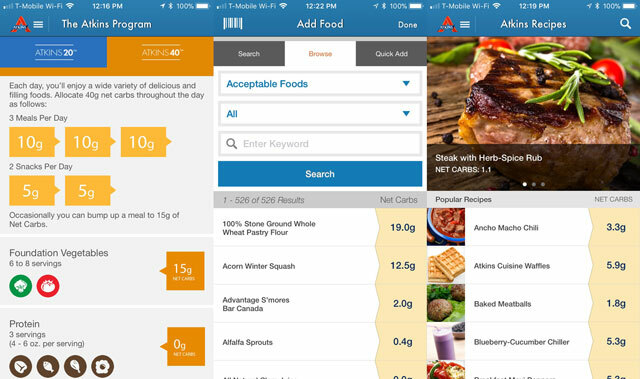 The app offers two Atkins diet plans. "Atkins 20" is a four-phase plan that begins with 20–25 grams of daily net carbs and ends with 80–100 grams. A list of acceptable foods — nuts and seeds, vegetables, healthy fats and cheeses, etc. — will guide you through each phase. The Atkins 40 plan is for individuals who have less than 40 pounds to lose and want more variety. It allots 10 grams of net carbs per meal with two snacks at 5 grams each with occasional bumps for high carb vegetables and other carbs. After registering and entering your personal information, go to "My Account" to choose your meal plan preference. In each phase, you can choose how many grams of carbs you want to eat, adding more net carbs as you reach your goals. Atkins.com includes suggested meals to get you started, along with a huge number of low-carb recipes, all for free. 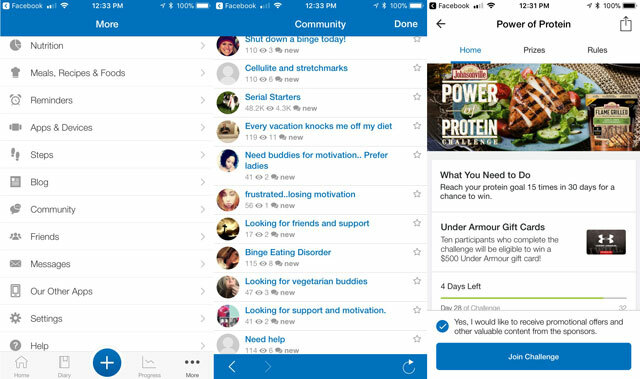 My Fitness Pal is a popular diet and exercise tracker app that makes it easy to join or create your own supportive community. Enter a sponsored challenge to win prizes, join an existing support group or invite friends to join you on your journey toward better health. You can challenge and encourage each other to keep track of what you eat as well as compete to see who can exercise more and burn more calories. In its free version, the app tracks calories and nutrients and has an active community feature. When you add the premium membership, you get more information to help you shape your diet. Premium features let you view your food intake by macronutrients — carbs, proteins and fats. The display includes the number of grams of each, along with a pie chart to illustrate your intake, and how many carbs you have left before you reach your limit. It also shows you how many carbs you've consumed by food item and by meal. Low carb goals can be set both daily and per meal in case you want to eat more carbs for breakfast and less at dinner time. Another premium feature analyzes the foods you eat, showing whether they're good or bad for you. It displays those that are highest in carbs and ranks everything you ate during the day. In a short time, you'll learn what to eat to maintain a healthy balance. The app makes it easy to add items, with a barcode scanner and an exhaustive list of foods to choose from. Still, it only works if you commit to honestly recording everything you eat. 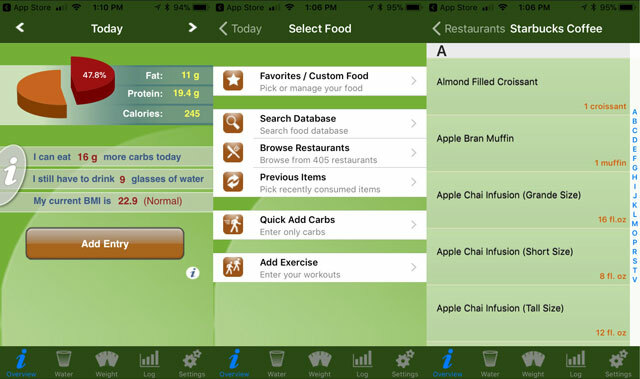 MyDietician is different from other diet apps. It pairs an actual (live) registered dietician with each user, so it's like having a personal trainer for your diet. Rather than list foods, you simply take a photo of your plate, a handful of nuts, a bag of chips or anything else you're eating (this is particularly useful when you go to a restaurant or make fresh dishes). When you sign up, the Quality Assurance Manager looks at your profile, objects and goals and assigns you a Registered Dietitian. Your assigned dietician reviews your food, exercise and water intake for the day and gently guides you to make healthier choices. This person is your partner, and while I loved my coach, it is possible to contact support if you feel another dietitian would be a better fit. Feedback about the previous day arrives before the end of the next day. On Wednesday, you’ll receive feedback for Tuesday. Friday, Saturday and Sunday’s feedback is sent by the end of the day on Monday. The dietician will send a message and/or include an audio or video response. My dietician was cheerful and encouraging. On good days, when I stuck to my eating plan, I received kudos, and when I strayed, she gave me tips to do better and get back on track. Each day she rated me from one to five stars on the amounts of sugar, unhealthy fats, fruits and vegetables, and sodium, and on the overall quality and quantity of the food I ate. I spent a month using MyDietician and lost more than 10 pounds simply by eating more healthily and paying attention to hunger/satiety cues to reduce overeating. My dietician sent me information on the right types of foods to eat and the best choices for eating out. Because I eat out frequently, I sent her a copy of a menu a day in advance and got her suggestions for what would be best to order. I was getting better educated on good nutrition, and I had a coach/advisor/partner in the process. 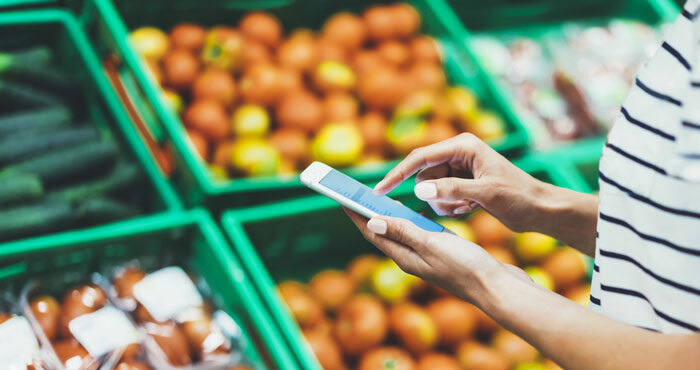 MyDietitian's founder, Ray Lyons, explained that while the app doesn't diagnose or prescribe specific types of diets to prevent or reverse prediabetes, it supports healthy eating habits that help users lose weight. MyDietitian has been chosen by the Center for Disease Control to administer diabetes prevention programs for corporate clients and large groups using their dietitians and their app. Because of the great success of MyDietitian in the corporate world, the company hasn't focused on obtaining individual users. But they're happy to have anyone interested sign up for their service. Their website is a little confusing, so it's best to email them (support@mydietitian.com), and they'll contact you to set up a subscription and assign you the right nutritionist. While the $79 monthly subscription might seem high compared to $10 or $15 for the typical diet app, the experience is truly like visiting a nutritionist every day. If you are at risk for prediabetes, or simply want to learn to eat better and be at your optimal health, I highly recommend trying out MyDietitian.